This has been the popular question lately from visitors to our studio and gallery, Blue Sage Pottery, over the past few months. Luckily, our studio is spacious, and we’ve been able to watch the hundreds of handmade plates and bowls steadily stack up. Making pottery by hand is a labor of love, and the historic processes I use take time. It all starts with a humble ball of clay. The wheel is then spun and I use my hands to form a cone, center the clay, open it and form the desired shape. But that’s just the beginning, as the form must be trimmed when dry, bisque fired, glazed and fired once more. The pot is touched many times, and I believe every piece holds the energy of all that attention and affection. 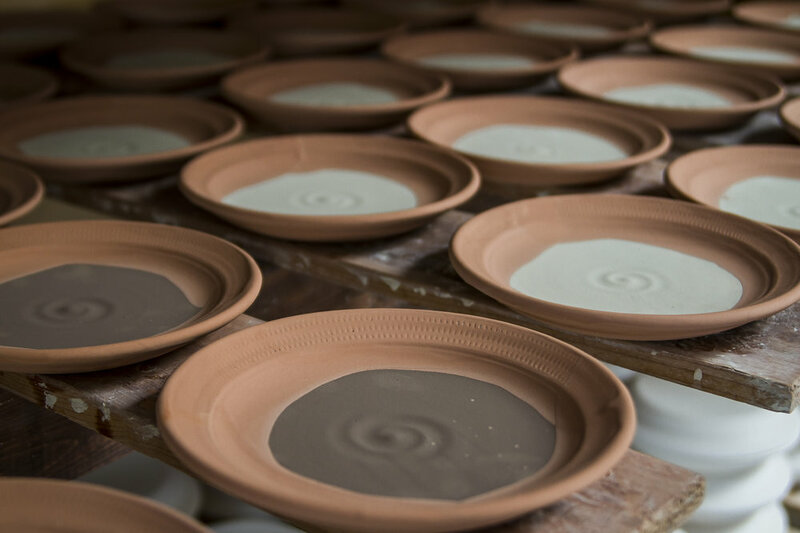 The energy that is devoted to the design, the making of every piece by hand, the mixing of our glazes and the “firing” of the pieces in our kilns can be sensed when using the piece. Making pottery is a process much like making food; the ingredients definitely matter. At Blue Sage, we use the best, most durable clays, and we make our glazes by hand, from scratch, with raw and local minerals. The skill of pottery making is honed from years of practice, and yet it’s still an intuitive process in which each movement of the hand leads to the next, much like cooking. The process of making the plates and bowls for Six Car, is similar to the process Six Car uses turn humble, fresh and local ingredients into cuisine. I suppose that’s why I was so interested in this project from the beginning. I took on the project of creating all the dinnerware by hand for Six Car, when I learned about their dedication to use local materials and local artisans and artists. My bent is localist also. Many of our glazes have iron-bearing clay, sourced right here in the Panhandle, and wood ash glazes made from ash gathered from friends and family. Glazes made from wood ash are literally the oldest glaze recipes in the world, and wood ash glazes have been a passion of mine for over fifteen years. I’ve developed my own recipes for glazes made with wood ash, and you can see these on the dinnerware at Six Car. Now that I think about it, I realize Six Car is much like my own kitchen. All the pieces in our cupboard are somewhat different, yet they’re all handmade. The majority of my plates, I’ve made myself. The plate is a surprisingly challenging form to make. There are many technical considerations. Every beginner potter wants to make a plate, but it takes years to consistently make excellent plates. Once one masters the art of making the plate, the plate can become a canvas of sorts. I ate at Six Car last Thursday night, and it was as I hoped. The cuisine was an exciting blend of textures, colors and flavors. The food was beautifully arranged on the pottery. The plates and bowls complimented the food, both in style and energy—a leisurely dinner with friends in which we shared superb food and excellent conversation. I know these meals will be a ritual! I hope you’ll find that my pottery adds to your new ritual of dining at Six Car.